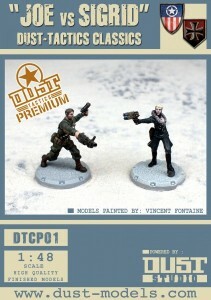 Dust Tactics hasn't seen these two available for a long time. But they're back to bring the pain to their enemies. Unseen since the first Dust Tactics Core Set went sold out, these two emblematic heroes of the world of Dust are back for a time! Please note that unlike our entire range, this item is limited. When these are sold out, they'll be gone forever! So if you want them, grab them as soon as you can or it might be too late.